There are many websites that offer consumers the promise of a stress free buying process, with maximum savings. Buying services like Price Promise through edmunds.com, Guaranteed Savings through truecar.com, Car Buying Services through usaa.com, autotrader.com, kbb.com, nada.com and so on. As a consumer, (I am one too) “Your Goal” is to save as much money possible. So logically, if you can buy one cheaper, by using these tactics, you are prepared to do so. I completely understand getting maximum savings! After all, the local dealership has to provide the same great service, regardless of where you make your initial purchase. Dealerships are operated by business men and women. Is it possible, that if you present a better documented price, with the same options, including all fees and taxes, that the local dealer would match it or in Terry’s case above, beat it by $100? It makes good business sense, right? Providing you with “Legendary Service” is my ultimate goal! I would like to invite you to consider “Value as well as Price,” when buying your next new vehicle. Would you like a car buying experience that is enjoyable and free of stress just like “Terry” above? 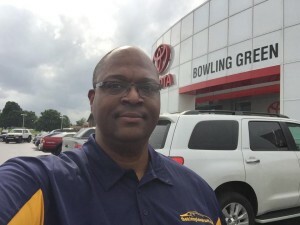 Then please give me a call/text at 270 779-2819 or send me a email at klandrum@toyotaofbg.com. It would be my pleasure to help you get not just the “Best Price,” but the “Best Car Buying Experience” you’ll ever have! Do you want the GUARANTEED LOWEST PRICE ON ANY NEW TOYOTA? Enter your information below to receive The Guaranteed Best Price Program!